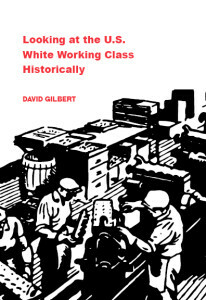 I spent the past weekend writing a German review of the new Kersplebedeb edition of David Gilbert’s Looking at the U.S. White Working Class Historically, originally published in 1984. While the original piece mainly consisted of reviews of three relevant publications – Ted Allen’s pamphlet White Supremacy in the U.S./Slavery and the Origins of Racism, W.E.B. DuBois classic Black Reconstruction in America, and J. Sakai‘s underground favorite Settlers – the new edition contains plenty of extra material, including Gilbert‘s essays „Some Lessons from the Sixties“ (1991) and „After the Sixties: Reaction and Restructuring“ (2017) as well as comments on the original piece by J. Sakai. The review I wrote was specifically aimed at a German-speaking audience, so there is little point in translating it here. However, I would like to name five aspects that I found particularly intriguing in a book that I recommend wholeheartedly to anyone interested in anti-racist and anti-imperialist class organizing. One, it shows that even if the juxtaposition of class and culture is a reality causing much havoc in the left today, it is based on wrong assumptions. There is no contradiction, unless we create it. Two, it reveals the shortcomings of an essentialist understanding of cultural appropriation that does not make the critical distinction between random, offensive, and commercial use of cultural expressions on the one hand, and considerate, respectful, and curious cultural interaction on the other. The latter does not exploitculture but create culture, which is per se progressive. To deny this means to rob ourselves of one of the most promising ways to transgress the structural divisions between communities that the system imposes on us. Gilbert writes that it is “an urgent priority … to look for the places where movements for justice can best organize white people for their long term interests on an anti-imperialist, anti-racist, anti-sexist basis.” This echoes the discussions about a new class politics that presently occupy large parts of the German-speaking left. Together with Sebastian Friedrich, I have written about this in an article for Counterpunch, which was mirrored on this blog. In his essay “After the Sixties,” Gilbert makes a distinction that we rarely encounter in anti-imperialist and anti-capitalist organizing: “The Left shouldn‘t try to outdo imperialism in promising workers at home a ‘higher standard of living.’ Instead, we have to show how we can work toward a better quality of life, especially for our children.” This is crucial shall people be reached with an honest and sustainable message. If we only measure a good life by people’s access to material goods, there is an objective reason for the white working classes to defend the imperialist status quo. In order for them to embrace a revolutionary project, they must also embrace different values. New classes for a new class politics. A winner. Now, please go out and get this book.